Share Food Home Cook extraordinaire, Vincent Ling, brings to the palette a popular Chinese New Year dish with a twist - Pan roasted Rabbit Fish. His innovative culinary skills in combining and re-inventing cooking methods have led him to infuse European styled cooking techniques into a very Chinese dish. Meticulously planned and creatively executed, Vincent Ling's Pan roasted Rabbit fish recipe is sweet to taste and brings out the natural flavours of this delicate fish without its fishy odour that comes with Bai Tu Yu or Rabbit Fish. 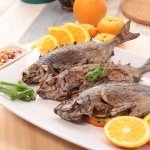 Try this simple recipe with other types of fishes and you'll be surprised with the results that you can get.